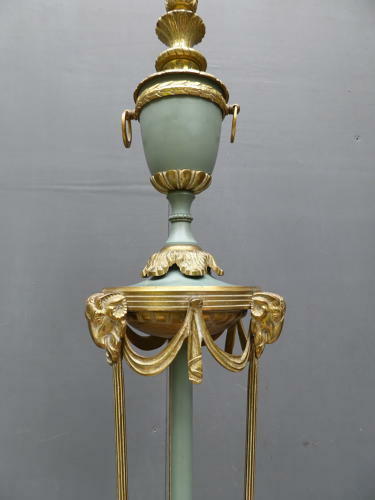 A beautiful large vintage floor lamp in the neoclassical style. An exceptional example in cast brass & pale teal paintwork with some wonderful detail. The heavy & detailed cast base gives rise to a central upright surrounded by three delicate pinstriped brass columns leading to the magnificent upper section. This features a neoclassical style urn with ring handles which sits on a platform surrounded wth drapery swags & embellished with three rams heads. A handsome, unusual & extremely high quality lamp. Rewired in a twisted silver flex. Wear commensurate with age, very good condition with some very light wear / marking to the paintwork beneath the urn. UK courier service available at £ tracked & signed for 48 hour delivery (Due to its height the lamp will be sent via a 'Large' service, hence postage cost).